I was recently contacted by Hershey’s and asked if I wanted to try their new Brookside Chocolate–real fruit juice pieces dipped in dark chocolate. I’m normally not a huge fruit and chocolate fan; I’m that annoying person that bites into every piece of chocolate in those holiday assortments then throws away the other half when it’s fruit filled, but I was pleasantly surprised! The fruit pieces are chewy and remind me of fruit snacks that I ate as a kid, and the chocolate is rich and has the right amount to complement the fruit without overpowering it. They currently offer three flavors: dark chocolate acai with blueberry, dark chocolate pomegranate, and dark chocolate goji with raspberry (my favorite). 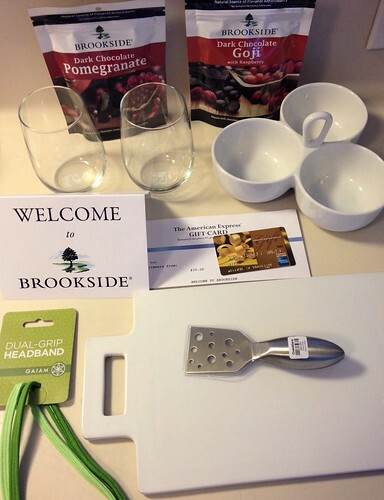 Brookside sent me all three flavors (I shared the acai blueberry before I had time to snap a picture) as well as a headband, stemless wine glasses, a candy dish, a cheese board, a cheese knife, (all from Crate & Barrel!) and an AMEX gift card (cheese, crackers, and wine anyone?) so I can relax and indulge with friends. And because Brookside is so awesome, one of you will win the same tasting kit! Leave a comment below letting us know what flavor you are most excited to try. For more information about Brookside, visit them on Facebook and Twitter. Brookside provided me with a tasting kit and will ship a second kit directly to a winner. Giveaway ends at 11:59 p.m. EST on Sunday, January 27, 2013. One winner will be selected at random shortly thereafter and contacted by email. Please note this giveaway is only open to residents of the U.S.
My 12-year-old son is requesting dark chocolate acai with blueberry. After all, don’t you want to test this product with an important demographic? I would love to try the pomegranate. I had the blueberry one and it was amazing. They didn’t have the raspberry in my store, so I’d love to try that one too. I’d like to try dark chocolate acai with blueberry. Thanks! Definitely most interested in the pomegranate, but I’d love to try all three! The dark chocolate goji sounds great! I am looking forward to tasting the goji bc I hear that goji berries have antioxidants in them! The dark chocolate goji with raspberry sounds wonderful! What a great flavor combo! They all sound so good, but I’m looking forward to trying dark chocolate acai with blueberry the most! The pomegranate looks so yummy! Dark chocolate goji w/ raspberry sounds delicious! I’m a huge blueberry fan, so I’d like to try the Acai with Blueberry. Can’t beat that combo with dark chocolate. Yum! Thanks for hosting the giveaway! Blueberry. Love it covered in chocolate! Definitely the pomegranate! They are some of my favorite fruits and combined with chocolate it looks utterly delectable. I would love to try the pomegranate! Oh, the acai/blueberry sounds divine! What a fun giveaway! I LOVE the Dark Chocolate Pomegranate, which I pick-up at COSTCO or Sam’s. Excited and eager to try the dark chocolate goji with raspberry, as raspberry is my favorite fruit flavor. i want to try the goji berry with raspberry flavor! I would love to try the pomegranate flavor. Pomegranate sounds amazing but I’ve never tried a goji berry so I would love to try that. dark chocolate goji with raspberry definitely! The dark chocolate pomegranate sounds great! I would love to try it! I love pomegranate, so I would like to try that one most. Thank you for including me! Definitely the dark chocolate and raspberry – yummy! Dark chocolate pomegranate sounds delish! I would love to try any of their flavors! They sound awesome!! I will be coming off a completely sugar-free January so I’m SO excited to try ALL of them!! The dark chocolate goji with raspberry sounds super yummy! I want to try the Blueberry Acai! I would absolutely love to try the dark chocolate pomegranate for sure! Dark Chocolate Pomegranate sounds delicious! The blueberry is the one for me! I love them and would love to try this whole tasting kit!! I’m not a big fruit and chocolate fan either…..but the pomegranate flavor looks pretty good….. Acai!!!!! They look so good. Did you get any of the crunchy I’ve been hearing about? Since I am the one who searched out the fruit creams ( especially the raspberry ones) I would love to try Goji raspberry! Sounds awesome. dark chocolate acai with blueberry. I’m not picky, I would love to try any of them! I love both I always by the Blueberry and Pomegranate snack packs but only when I go back to Pennsyvania. BJ’s is the only place I can find them. I buy the bag of Pomegranate because its the type I can buy here in NC. I just found the Raspberry online and I bought 2 bags online. Can’t wait to try them. I really love both blueberry and pomegranate can’t really say I like one over the other. I will be back to give a comment on the raspberry once it arrives.